media.h-moser.com :: A GOLDEN HEART PROTECTED BY BLACK TITANIUM ARMOUR: ENDEAVOUR PERPETUAL CALENDAR BLACK GOLDEN EDITION FROM H. MOSER &amp; CIE.
A GOLDEN HEART PROTECTED BY BLACK TITANIUM ARMOUR: ENDEAVOUR PERPETUAL CALENDAR BLACK GOLDEN EDITION FROM H. MOSER & CIE.
A titanium case with polished DLC finishing is the armour protecting this exceptional solid gold movement and dial. 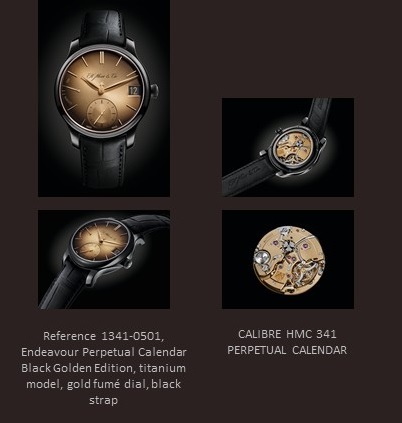 In a very rare combination, exemplary of traditional watchmaking craftsmanship with a fresh new approach, H. Moser & Cie. introduces the Endeavour Perpetual Calendar Black Golden Edition in a series limited to only 10 pieces. The HMC 341 manufacture calibre housed within this watch is a sophisticated execution of the ingenious perpetual calendar movement (winner of the Grand Prix de Genève for a complicated watch), with solid gold plates and bridges, hand-engraving and a Moser escapement with the Straumann Double Hairspring®. Building on the exceptional qualities of the Perpetual Calendar, this unconventional watch combines a strong, scratch resistant material for the case to house a special H. Moser movement. Set with solid gold plates and bridges, this movement houses a Moser escapement with the Straumann Double Hairspring® and two functional diamond end-stones, chosen for the clear colour they lend to the final design. Double barrels set below two screwed golden chatons enable a minimum 7-day power reserve, indicated by the display on the dial at 9 o’clock. The colours of the gold fumé dial with a sunburst pattern flow from a warm gold to shaded fumé tones that blend into the dark polished titanium case. Punctuated by the Perpetual Flash Calendar at 3 o’clock, the dial has a noticeably large date window with golden numerals. This calendar may be adjusted forward and backward, at any time – an exceptional ability for a perpetual calendar – making it very easy to use. To set the perfect finish, a limited-edition elegant Macassar wooden box accompanies this masterpiece that is available from July 2014. H. Moser & Cie. was created by Heinrich Moser in 1828. Based in Neuhausen am Rheinfall, it currently employs 50 people, has seven of its own calibres and produces 1,000 watches per annum. H. Moser & Cie. manufactures parts such as regulating organs and balance-springs, which are used for its own production as well as to supply its partner companies. H. Moser & Cie. is honoured to have a Moser family member with the company as honorary chairman of the board and president of the Heinrich and Henri Moser Foundation. The aim of the Moser Foundation, created by one of Heinrich Moser’s descendants, is to keep the family history alive and seek out antique pieces for the Moser Museum, located in Charlottenfels Manor, Heinrich Moser’s family home. With its substantial watchmaking expertise and highly acclaimed experience in the sector, MELB Holding holds shares in H. Moser & Cie. and Hautlence. MELB Holding is an independent family group, based in the heart of the legendary Vallée de Joux.